Several thousand activists have marched in the Moroccan city of Marrakesh to demand environmental justice, just a few miles away from where high-level UN climate change talks are being held. 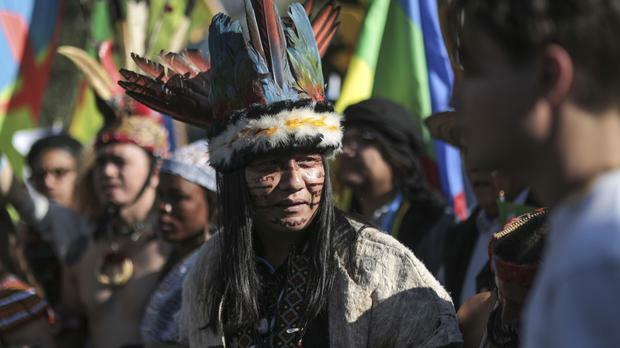 Native Americans protesting against the Dakota Access Pipeline demonstrated on Sunday alongside local indigenous Amazigh groups protesting against a Moroccan company's expropriation of water resources, in addition to dozens of international civil society groups. The protest for fairer climate deals took on greater importance after the election of Donald Trump as the next US president. He has called global warming a hoax and promised to "cancel" last year's landmark Paris Agreement, under which nations pledged to limit emissions to slow climate change. US Secretary of State John Kerry, UN Secretary-General Ban Ki-moon, and French President Francois Hollande are expected in Marrakesh on Monday.